For an authentic Dodge SUV experience in a package that can keep your whole family safe and comfortable, look no further than the Dodge Durango. This billet clear coat SUV has a 8 speed auto transmission and is powered by a 360HP 5.7L 8 Cylinder Engine. Our Durango's trim level is R/T. The R/T name is known for performance and this R/T Durango is no exception. A huge V8, 8 speed transmission, a really cool electronic T shifter, sport mode, performance steering and suspension, rear load leveling suspension, a high speed engine controller, all wheel drive, and paddle shifters really keep you moving. Rain sensing wipers, roof rails, acoustic windshield, automatic HID headlights, memory power heated mirrors with integrated turn signals, racetrack LED taillamps, LED fog lights, LED daytime running lights, a power liftgate, aluminum wheels, rear view camera, rear parking assistance, remote start, and ready alert braking keep you safe, while also providing style and convenience. For navigation and connectivity, you get the Uconnect 4C NAV infotainment system with navigation, a 8.4 inch touchscreen, Apple CarPlay, Android Auto, Bluetooth, SiriusXM with Travel Link and Traffic, USB with dual remote USB, SD card slot, aux jack, a premium Alpine sound system with 9 speakers, and a 115 volt power outlet. For unmatched interior luxury there are chrome interior accents, leather door panels, auto dimming rear view mirror, leather seats, heated front and 2nd row seats, ventilated front seats, power driver seat, front passenger power flat folding seat, heated leather steering wheel with audio and cruise control, full color customizable instrument cluster display, 3rd row seating with remote folding headrests, 2nd row fold and tumble seats, illuminated front cup holders, proximity entry, and automatic tri-zone climate control. 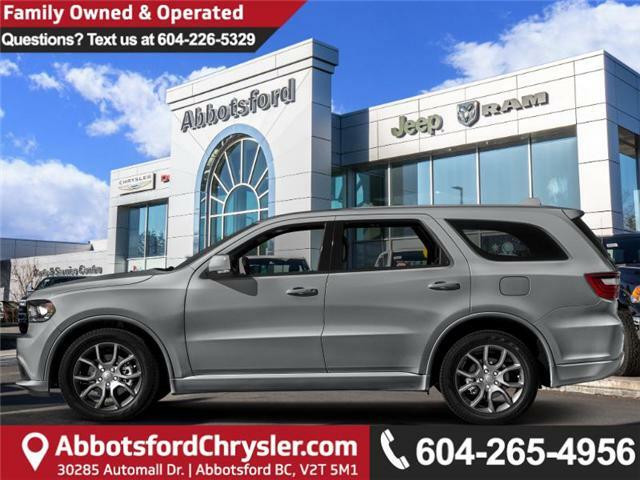 This vehicle has been upgraded with the following features: Hemi V8, Sunroof, Leather Suede Bucket Seats. View the original window sticker for this vehicle with this url http://www.chrysler.com/hostd/windowsticker/getWindowStickerPdf.do?vin=1C4SDJCT6KC740713. Buy this vehicle now for the lowest bi-weekly payment of $398.24 with $0 down for 96 months @ 4.29% APR O.A.C. ( taxes included, Plus applicable fees ). Incentives expire 2019-04-30. See dealer for details. * Every reasonable effort is made to ensure the accuracy of the information listed above. Vehicle pricing, incentives, options (including standard equipment), and technical specifications listed is for the 2019 Dodge Durango R/T may not match the exact vehicle displayed. Please confirm with a sales representative the accuracy of this information.